This is a 4oz half size jar of our CBD coconut oil. Hello, health! All of the health benefits of coconut oil combined with the therapeutic value of CBD. It’s non-psychoactive, all natural, vegan, and free of gluten, sugar, GMOs, toxins, THC and anything artificial. Eat it, swish it or slather it. The possibilities are endless. 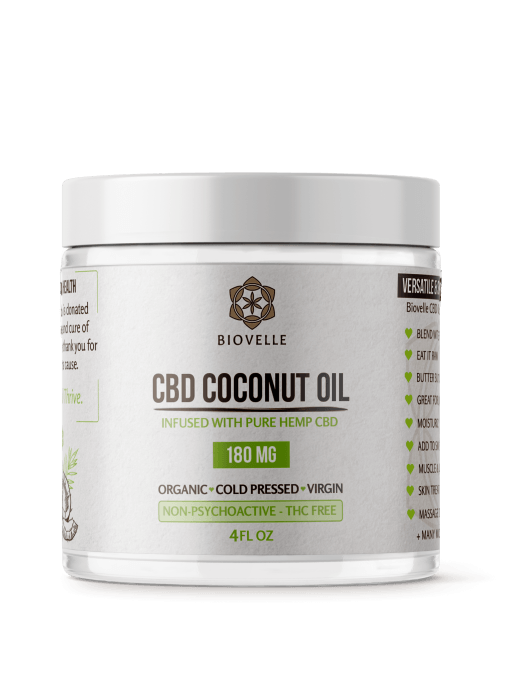 All of the health benefits of coconut oil combined with the therapeutic value of CBD. Organic, virgin, unrefined cold-pressed coconut oil from the Philippines infused with pure hemp-derived CBD (cannabidiol). It’s non-psychoactive, all natural, vegan, and free of gluten, sugar, GMOs, toxins, THC and anything artificial. Eat it, swish it or slather it. The possibilities are endless. Nutritional supplement or topical oil. 4fl oz with 180mg CBD per bottle. Suggested dose: 2 tsp (15mg CBD), but individual dosage may vary. Best if used consistently. Suggested use: Eat it raw, blend in your smoothies, coffee, or your favorite foods. Also, great for oil-pulling. Topical: can be used as a topical salve, body moisturizer or massage oil. I buy this for my mom to help with her pain relief, and she really feels like it helps. She still hurts, but nothing she has tried has completely taken her pain away and this is her favorite product to use. I recently upgraded from 4oz to 8 oz jarvas w were going through it too fast. Family ‘discovered’ my coffee hack and now I can’t keep enough on hand it seems. Great product. I need s monthly auto-ship! I use this in most of my food/cooking! Really helps with digestion! I love this product so much!! I take it internally with my morning coffee and when needed rub it on external aches and pains. I gave it as a Christmas gift and my friend loves it too! This product is awesome. I’ve never really experimented with the oil before and I’m a complete convert. I add it to my coffee every morning and I feel generally calmer and more mellow and less fazed by the the craziness that I wake up to in my inbox, social media, text messages etc. that are virtually impossible to avoid! I’ve recommended this product to a ton of friends too. Thank you for introducing it to the market! I just wish this oil came in a bigger bottle. Taking it creates a noticible difference in my anxiety levels, sleep quality, aches and pains, etc. Easy to add to just about anything… I put it in my tea. Love Biovelle! My husband and I use it in our coffee every morning. I don’t have pain or anxiety but what we notice is it gives us great mental clarity . Wonderful way to start the day. Thank you Biovelle for such a quality product. I love this product. I just used the last of my 4oz. jar and now am ordering an 8oz. I add it to my coffee every morning. It helps with anxiety and is good for anti inflammatory properties as well. I quickly realized that I needed to ‘upgrade’ from the 4 oz jar to the 8 oz jar. Its worth it! I add to my coffee every morning. I’m now buying for friends and family to share the love and joy of this lovely product. I have not cooked or baked with this yet, but eager to try. Love this product. It balances out some of my anxiety and i add it to my coffee every morning. I have been using CBD (derived from hemp) oil in a liquid form and take it sublingually daily. I love its effects, but the taste is nothing less than earthy. 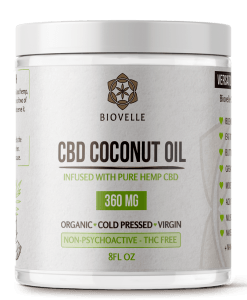 Enter: Biovelle CBD Coconut Oil. Delicious, effective, calming, bliss. I enjoy it straight from a spoon or, my favorite way, is in coffee prepared either in the Vitamix to blend it into a velvety smooth treat or frothed with milk and added to a shot of espresso, making it a delicious CBD-infused cappuccino treat! I know there are countless other ways I will continue to use Biovelle! Nothing short of amazing. Love this product! It has so many uses. I’ve only had for about 3 weeks and I’ve already used it for three things and saw great results immediately! 1) Plantar Fascia running injury aka foot pain near the heel. Applying Biovelle topically has immediately helped tame the pain and inflammation. Treating the inflammation should help support overall healing. 2) Headaches/Migraines – have applied Biovelle topically and mixed it in smoothies or matcha for fast relief without taking medication. 3) Menstrual cramps – have applied Biovelle topically on my abdomen and low back. As a result – this month I only had to take a total of one dose of OTC pain medicine versus typically taking a dose every 3-4 hours. Thank you Biovelle!!! I can’t wait to discover more uses for this product. Wonderful product – can’t wait to get to cooking/baking with this little dream jar of coconut oil! Right now we are putting it in our coffee and espresso everyday. A great way to start your day. Gives the cup a lovely, smooth and creamy flavor. Enjoy!! Will be ordering larger size jar soon. Obsessed! I love this product! I have found that it has helped me sleep at night and the coconut oil has a great taste. I add it to my coffee everyday. What a great product! I tooo was a little skeptical but have read sooo much about CBD and I love coconut oil. It has reduced my anxiety and I have less stomach issues. The coconut oil is one of the best I have had. It’s definitely something that will become a staple in my everyday routine. 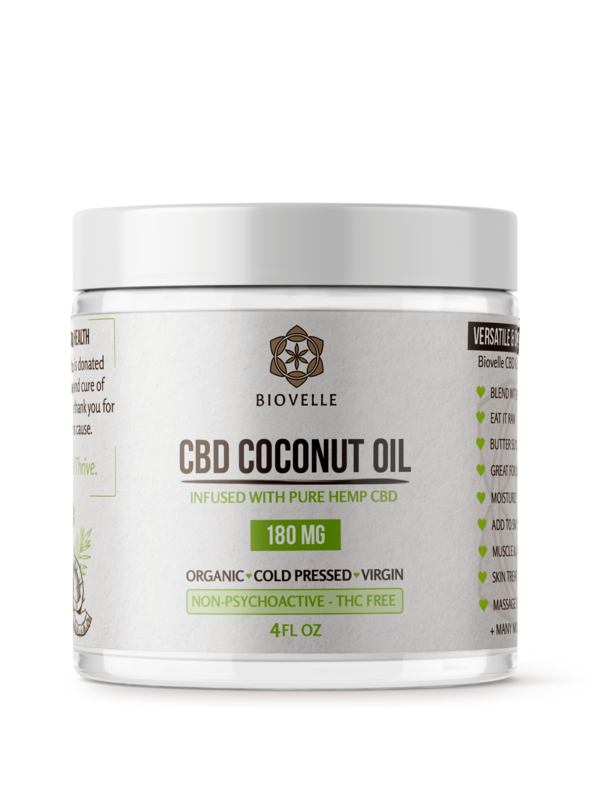 I love Biovelle CBD coconut oil. It’s has tremendously improved my dry skin and acne. Tastes great too! This is a life-changer!! Seriously such a difference in my anxiety and pain since I started using Biovelle. Already on my second jar. I was a skeptic at first since nothing else has worked, but holy cow, this is amazing. I can literally feel my anxiety melting away when I use Biovelle. Putting it in my smoothies and anything I bake, plus just rubbing it on my shoulders makes a huge difference. Can’t thank you enough for this product!! Delicious! The best tasting coconut oil hands down! The CBD is so helpful with managing my IBS! I love you Biovelle! I broke my leg my freshman year of college and this stuff works WONDERS! I have it every night before I go to bed and even rub it on my leg when it’s feelig sore. LOVE IT! I cannot say enough about how fantastic this company is! I ordered for the first time (with some user error issues) and I received consistent emails helping me resolve the issue until they saw my order come through. I love the product and I love the hand written notes that come with it! I love it, I put it on my joints when they’re aching, such a blessing to have bought this ♡ thank you Biovelle!! This product saved me! I get horrible cramps with my period. I just met with my doctor last month and was diagnosed with endometriosis. We were debating surgery but I wanted to give it a few months before taking that leap. As soon as my cramps started I took this right away. This is the calmest my cramps have been in years! Thank you for this product and thank you to Bethany from lilsipper for recommending this incredible product! I didn’t even finishing my 4oz jar before ordering the 8oz. I LOVE this for my coffee and morning smoothies. It’s also perfect as lip balm. Just an all around fantastic and versatile product. I am a dedicated consumer now! Thank you for such an amazing product! After suffering for months with guttate psoriasis I had stumbled on his little gem. Trying countless products, regimens and dietary changes this product has been the ONLY thing that has given me a substantial amount of relief. No longer dry, itchy, red, irritated scales. Kudos to a great product and so glad I’ve finally found something that actually works and is a better alternative than others. I’ve been using this everyday since I got it! In my coffee, on my toast and I esp LOVE it on my face. I initially bought it to help fight inflammation caused by Ulcerative colitis symptoms but Ive also noticed a change in my anxiety, sleep and mood.. All for the better! I cannot even put into words how much this product has helped me already. I’ve only been taking it for about 5 days. Getting to sleep is not an issue anymore, anxiety is almost nonexistent, I’m so calm now. Even my friends and family have noticed a change in me. It’s also helped with my sore knees from running! I can’t believe it. I will continue buying from y’all and I’ve already told everyone I know to give it a try too. Thank you guys so much! P.S.- I’ve always been a skeptic of holistic remedies but I am sold on this stuff! So far, so amazing! I’ve only been using it since I received it 5 days ago and I instantly feel the results. I use it in my turmeric, ginger tea in the evenings. I sleep better and my body aches less from exercising and from inflammation from my auto immune disease. Also works quickly if you use as a rub on sore muscles. I was told the recommended use is to keep below 160 degrees Fahrenheit in order to preserve the integrity of the CBD. Can’t wait to bake tasty treats and add in my smoothies. Definitely buying for my family and friends!